In darshan I do individual work. I see people’s problems and help them. Some are very receptive to the help, some are not so receptive. At the end I collectively fill the hall with light that brings balance, peace and harmony into their lives. Darshan is the bestowal of love, light and grace. Mother gives Darshan in silence. It is offered free of charge to all who come, regardless of individual beliefs or affiliations. Darshan is Mother’s gift to humanity. While in the Darshan Hall, guests sit quietly, meditating and praying with eyes open or closed. Each person has the opportunity to receive an individual Darshan from Mother. After the individual Darshans, Mother gives a silent blessing to the entire group. Q: Why is Darshan performed so simply, without singing, for example? MM: People are too active and rarely sit quietly. In silence one can receive more because all one’s activities become concentrated at one point. My teaching is to give only the essence, the Divine, that which is necessary. I give exactly what is needed by each person. Paramatman in silent. God is silent. Everything comes out of silence. In silence more work can be done. The true experience of bliss is without words. Q: When we have your Darshan we do pranam (bow down) in front of you and you take our heads between your hands: what are you doing? MM: On the back of the human being is a white line running up from toes to the head. In fact, two lines start from the toes, rise along the legs, join at the base of the spine and then become a single line reaching to the top of the head. This line is thinner than a hair, and has some knots in it here and there which divine personalities help to undo. It is very delicate work and great care has to be taken to undo the knots, as there is danger for your life if the thread is broken. When I hold your head I am untying those knots. I am also removing other kinds of obstacles to your sadhana, your practice. When I touch your head, the Light moves upwards in the white line. It indicates, like a meter, the development of your sadhana. When there is no progress, the Light moves downwards along the line, showing the degree to which your sadhana has deteriorated. When the Light is continuous from the toes to the top of the head, the person may have many experiences and visions, although some people have visions and experiences without this white line. When the line gets to the top of the head, people have the Paramatman Darshan. When the line has gone above the head, then there is a constant relation with Paramatman. If your aspiration weakens, the line moves downwards as I said. One day you might even fall from your sadhana. This is a great crisis, which can, however, be prevented. In the front of the body are two red lines starting from the toes, growing gradually upwards on either side of the legs and tending to meet at the base of the spine where the white lines become a single one. If the red lines reach the white line, you will achieve absolute detachment. This rarely happens and only to those who have the Divine Shakti. By the growth of the white and red lines the sadhana will be established permanently without possibility of a fall. If the red lines develop fully, you will reach great heights. The white lines will also help to support the experiences of those who have a psychic opening. Even when there is a psychic opening there is still the possibility that it will close. 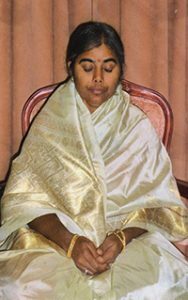 The opening of the psychic is effective for sadhana, but it is not enough. The establishment of the white and red lines will help you to keep the psychic continually open. If the psychic can be compared to a flower, the lines are the plant itself. Q: Is the Mother courageous and strong during Darshan? Adilakshmi: The Mother is very courageous, strong and gracious. Nearly four hundred eyes focus on her during Darshan but she is always calm, still and unchanging.